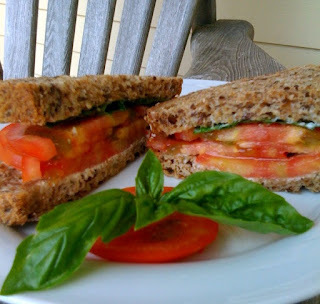 Every summer I look forward to the first bite of a tomato sandwich made with garden fresh tomatoes. Today's version (I eat them almost daily during the tomato harvest) was made with the health loaf from The Vinegar Factory in NYC. We always stop in our way out of the city, and you can read my holiday post if you're not familiar with this wonderful establishment. I used to think that tomato sandwiches should only be made with white bread, but things change as we get older. I toasted up a couple of slices of this delicious bread, then spread a little Hellman's mayo, added my garden tomatoes (do keep them at room temperature as they are so much more tasty). Sprinkle with a little salt and pepper, then add a few leaves of fresh basil. Voila! It's one of my favorite summer treats. Laurie! Whenever I need a great idea for something to bring to a summer party, I check out your page! Granted I don't like beets, BUT I do LOVE tomato sandwiches. I miss you and your family, my fam (esp. the girls, give big hugs), and New England in general. :) Hope all is well and keep up the lovely page!